Speaking of enigmas, is this place a night club or a restaurant? More importantly, will it ever get enough customers to justify whatever expense it took to convert the space from the Thai Room II, and is the food worth a trip to Las Vegas Blvd. South (beside The Bootlegger) to supp on some serious Soviet sustenance? And finally, we’ve got to ask: Is Las Vegas clamoring for another Russian restaurant? The answers are: We don’t know, we don’t know, a qualified “yes,” and probably not. All we know is the place was an empty as a gambler’s soul when we had lunch with Mad Max Jacobson there over a week ago. But the food was pretty darn tasty, if by “tasty” you mean it reminded us of the stuff we had in Leningrad and Moscow over thirty years ago. By that we mean it was earthy, elemental and rib-stickin’. Jacobson found the stuffed chicken leg “nicely spiced,” when he dined here for his review, but when we dined together, we both found the forcemeat, and the chicken, dull and bland. However, both soups — kharcho (a Georgian vegetable/meat concoction – Stalin’s favorite!) and borscht — tasted like they came straight from the Volga boatmen, and Chef Rima Leonaviciute does such an excellent job with her pelmeni (stuffed meat dumplings) that Slapsy Maxey and me could’ve made a meal of them. Less successful was the strange, tomato-infused, pink stroganoff sauce blanketing strips of tender beef — heavy and not worth the calories. But the fresh fruit cup we shared was surprisingly all that, and just the antidote to all that sour cream and meat. It’s a bit early to bet on the clientele who may yet popularize this place, but our money’s on thick-faced, stubby-fingered Russian mobsters squiring around six foot tall “models” with strange and indecipherable accents. Our vodka-free lunch for two (with a ton of food) came to $57 + a fifteen dollar tip. Not sure what to make of this place…but I’m pretty certain that my lunch will not be vodka free. The Ruskies would have it no other way. That was just amazing place! It is my type of restaurant. 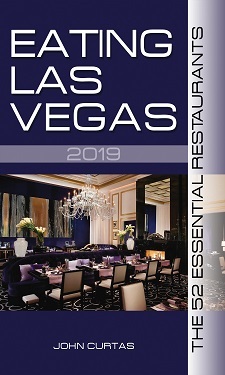 I just had dinner there on a business trip to Vegas last week while I was looking for somewhere to eat near the Hilton Garden Inn a few doors down. It is a very strange place – I was the only diner there on a Friday night around 7:30pm – definitely looks more like a club than an restaurant. I’m sure it would get hopping later in the evening. This was a very disappointing experience. We went on a Saturday evening for dinner. At 5 pm “music” started- so loud that we could not talk to each other and at a volume that could be injurious to the ears. I had investigated the menu on the restaurant’s web site. However the menu there was nothing like the web site- very small with only one salad, no soup and perhaps 8-10 entrees. The food was just OK- by no means extraordinary and the portion size was quite small considering the price. We had a Greek salad and beef stroganoff. The latter came with rice and the sauce was tomato flavored. We did not remain for dessert- couldn’t wait to get away from the noise. We definitely will not return there.